This is it. The big kahuna. The ultimate centerpiece for a holiday dinner. The most majestic (and possibly expensive) piece of meat you will ever cook. The English know it as roast beef. Your butcher sells it as prime rib. I call it one of the best ways I know to create high drama (and possibly a little envy) when you bring this dark, crusty, sizzling, garlic- and rosemary-scented hunk o’ heaven to the table. Despite its power to shock and awe, prime rib is surprisingly easy to cook: It takes only 10 or 15 minutes of prep time and an hour or so of spit-roasting or indirect grilling. In this blog and one next week, we’ll tell you what you need to know to nail the prefect prime rib on the grill every time. First up, how to buy it. 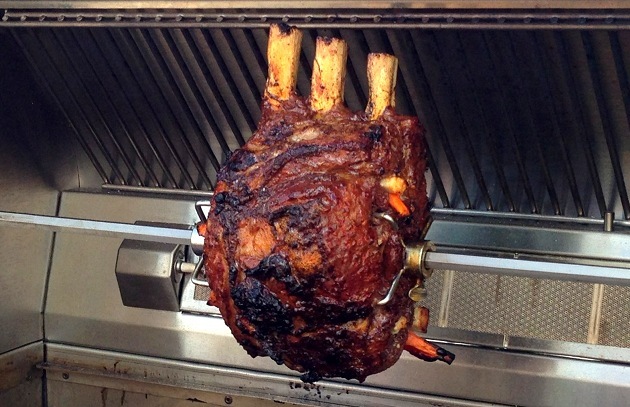 Prime rib defined: Sometimes referred to as a standing rib roast, prime rib is one of eight primal cuts of beef. A full prime rib is comprised of the sixth through the twelfth ribs (seven bones), but is often cut into sections by the butcher before being sold: A whole prime rib roast can weigh as much as 25 pounds. Anatomically, it is located between the chuck and short loin sections (also primal cuts) and on top of the plate. Like beef tenderloin, the “eye” of the muscle receives little exercise, making it exceedingly fine-textured and tender. Choice versus prime: Yeah, I know it’s called “prime” rib. (The name of this pricy cut predates the USDA’s meat grading system.) So it’s possible to buy “prime” rib that actually has been graded as “choice: by an inspector. “Choice” meat has less fat marbling than prime. If you have access to a top-notch meat counter, you can buy “prime” prime rib. You’ll pay roughly 25 percent more for it than choice. Great if you bought Twitter before it went public, but in my experience, “choice” prime rib delivers plenty of flavor and tenderness. Dry-aging: If money is no object—and when are you going to splurge if not the holidays?—some high-end butchers sell prime rib that has been “dry-aged” under carefully-controlled conditions in a walk-in refrigerator. Connoisseurs insist the richer, gamier taste of this super-premium aged prime rib is worth the additional 25 to 50 percent cost. 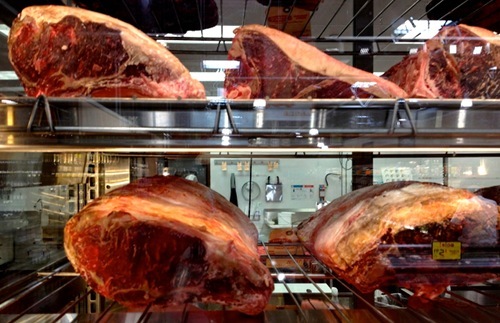 (The butcher looses as much as 25 percent of the meat through evaporation and trimming—hence the high price. Grass-fed versus grain-fed: This is another area of confusion for the conscientious American consumer. The term “grass-fed” implies the animal was fed a diet of grass—a bovine’s natural diet—its entire life. Straight grass-fed beef has a distinctive flavor, but lacks some of the rich mouth-feel of grain-fed beef. One compromise is to buy natural or organic beef that grazed on grass for the first year or two, then switched to a grain diet for several months prior processing. Note: another advantage of grass-fed beef is that studies have shown it to be less susceptible to food-borne illnesses like E. coli. How much is enough? : A whole 7 bone prime rib is a daunting hunk of meat (impressive, yes, but daunting) that tips the scale at as much as much as 25 pounds. We have cooked them at Barbecue University, and I can tell you, eyes will pop and jaws drop. For most of us, a 4 bone prime rib (weighing about 8 pounds) has plenty of wow power and will serve 8 people comfortably. A single rib section will serve 2 to 3. Next week we’ll tell you more about trimming, prepping, and cooking prime rib. What will be featured on your holiday table this year? Let us know on the Barbecue Board.